I may have had to watch the Florida vs. Toledo game on my iPad because it was on ESPN3 and not a regular network, but I didn’t mind. Gator football is back! Can you tell I’m excited? The game started around 9 AM here on the West Coast so I got up a little early to make sure I was ready for the first Florida football game of the season. 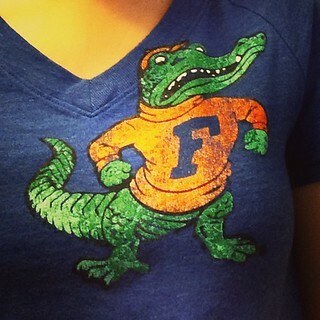 The first order of business (after donning a Gator t-shirt, of course) was breakfast – especially since I’m trying to revamp my eating habits (as described in Thursday’s post). Unfortunately I’ve had some stomach problems the last few days so I wasn’t sure what food options were going to be compatible with my digestive system today. I played it a little safe with a blueberry pomegranate smoothie from McDonald’s rather than my usual Egg McMuffin. I’ve been pretty lazy for the last couple of days due to whatever weirdness is going on in my belly, but I really need to be productive this weekend since I’m supposed to leave for Florida next Sunday. Yikes! Luckily it’s a long weekend and my stomach seems to be a bit better today. So how did I make the most of my time during the Gator game? I baked cookies, of course! Double dark chocolate chip cookies and funfetti sugar cookie bars. Both batches turned out pretty well so I’ll be posting those recipes soon. Baking might not have been the best use of my time, but it was certainly enjoyable while watching the Florida win. After the game I ran a few errands and then came home and started packing for Florida. It’s extremely daunting to pack for a trip that will more than likely last about six weeks. I can only take so much stuff with me so I have to be a bit selective. There are some items that I will be better off buying when I get there rather than hauling them across the country, like mouthwash and body lotion. And although I’m going to be wearing jeans, t-shirts, and sneakers to work most days, I really need to pack some other items for use under different circumstances. All of this is making my head spin. Hopefully I can fill my suitcase with the things I need without it going over the airline weight limit! I may have to bring a larger carry on bag than usual. I’ll think about that some more tomorrow. I ended my day with a jog (5 miles jogging out of a 7.5 mile route) which was really pleasant after the sun went down. It’s been hot in Los Angeles this past week, but luckily the temperature drops about 20 degrees in the evening. That’s the only thing that makes the heat wave bearable! Sometimes I miss air conditioning. Now it’s time for bed so I can get up tomorrow and make the most of the second day of my long weekend. Good night! Since I started running I’ve decided that I need to implement a new meal plan. After getting a stomach ache more than once after going running too soon after eating I’ve come to the conclusion that I really shouldn’t eat much after lunch on days that I jog. This is compounded by the fact that I don’t have much of an appetite after I jog, meaning that I often go to bed without any dinner on those days. So it seems I need to get more calories earlier in the day. I’ve never been much of a breakfast person, but my usual Slimfast shake in the morning and Clif Bar for lunch haven’t been keeping me full during the day anymore. Eating more seemed counterproductive to my exercise regimen, but I know that my body needs fuel! So the first change I’ve made is swinging my McDonald’s on my way to work for an Egg White Delight McMuffin. It’s only 250 calories and it has enough of protein and fiber to keep me full all morning. And it’s delicious! The perfect win-win. My ultimate goal is to make breakfast sandwiches (and other items) at home rather than having to go to McDonald’s every day, but I think I’ve taken a good first step. Now it’s time to figure out some more substantial midday meals. When I go out to lunch with my co-workers I definitely get plenty to eat (even if it’s not always that healthy), but I’ve gotten out of the habit of bringing anything but energy bars with me from home. I need to be making sandwiches and salads and other stuff for lunch instead. I’ll try to work on that next week. I probably should be doing more cooking so I can take leftovers of more substantial things for lunch, but cooking for myself isn’t very exciting. Plus, I’m leaving for Florida in a little more than a week and I’ll have to establish a whole new routine when I get there. Hopefully I can keep up the healthy habits while I’m on travel! Chocolate chip cookies #36: Based on All Things Katie Marie’s Oatmeal Chocolate Chip Cookie Bars. Baked on 8/9/13. One of my East Coast co-workers requested oatmeal cookies when I went out there a few weeks ago and I was happy to oblige. Of course I picked a recipe for oatmeal chocolate chip cookies because how else can I add to my growing list of chocolate chip cookie recipes? Needless to say I’m still enjoying different variations to find the best ones. And as I’ve made obvious in a few previous posts (for evidence see my first oatmeal chocolate chip cookie recipe and my caramel apple oatmeal cookie recipe), I’ve tried making oatmeal cookies a few times before, but never as cookie bars. So this time I tried a slightly different recipe and adapted it a bit too. I ended up using 2 Tbsp more butter and 1 c less oatmeal than called for. I think these were two good decisions, but I should have added a little more sugar because I don’t think these turned out quite sweet enough. Even an extra 1/4 c of sugar would have helped so I’ll do that next time. I also added 1 oz of freeze-dried strawberries for an extra layer of flavor (and because they’d been sitting in my cabinet for months gathering dust), but I really should have doubled that. Some cinnamon would have been good too! Live and learn, I guess. I’ll experiment with the ratios of ingredients and see how much I can improve this recipe. Some of my readers (all two of you!) already know that I will be going to Florida for work this fall. I’m leaving two weeks from today and I’ll be there for over a month. Crazy, huh? So now that you all know the facts, you might as well also know that I’m a little stressed about this trip. There are so many things to consider when leaving home for that long a period of time! Not just what to take with me (or how much to take with me), but taking care of everything I’m leaving behind too. I’ve never been away from my primary residence for this long before and I’m afraid of surprises. So today I started making two long lists – a packing list and to-do list – so I don’t forget anything. Hopefully, at least. I’ll keep you posted on how that goes. In the meantime, I had a great weekend while mostly ignoring my upcoming business trip. I’m doing everything I can to make the most of these last two weeks in California by doing everything that I love. So where did I go first? Disneyland, of course! This was the last weekend that the parks opened at 8 AM (the “summer” season is ending soon) so I figured I’d better take advantage of the early morning hours when the crowds are thinnest. Plus next weekend is a holiday AND the Disneyland Half Marathon so I’ll probably stay away to avoid getting caught in that madness. So yesterday I woke up early and had a great morning at Disneyland and California Adventure. Around lunchtime I walked over to the Downtown Disney AMC theater and caught a showing of “The Mortal Instruments: City of Bones.” I was really excited about this movie, but I hate to say I was disappointed by it, to say the least. City of Bones is one of my favorite books so it’s not that I didn’t love seeing it come to life, but the film adaptation was…cheesy. Really cheesy. I definitely wouldn’t recommend it if you haven’t read and liked the book. But I’m still glad I saw it. After the movie I went home, washed off my sunscreen (I’ll be posting another sunscreen experiment soon), and grabbed something to eat. Staying on the couch for the rest of the evening was tempting, but since I wasn’t going jogging that night I decided to go out and do something instead. So I drove down to South Coast Plaza to return a dress to Ann Taylor and look for some new clothes, and I was actually fairly successful! I bought a pair of khaki pants and a pair of corduroys at J.Crew which was amazing considering how much trouble I’ve had finding pants for work. They’re a bit more stylish that I would usually wear, but it’s time for me to take some fashion risks and see if they pay off. Today was a but less eventful than Saturday, but I still got a lot done. I went to an early showing of “The Wolverine” at the Block at Orange and I really enjoyed it. Especially the extra scene after the first part of the credits. I’m already looking forward to the next X-Men movie! After than I got some lunch and walked around the stores. Not much luck there, but I got a couple of pairs of shoes to go with my new pants. I hope. I haven’t tried them on together yet. Except for my evening jog the rest of my day was pretty quiet. You know, washing dishes, cleaning up messes, working on blog posts, etc. I would like to brag that I jogged 4.5 miles out of my 7.5 mile route tonight, mostly in 0.7-mile increments, and it wasn’t too difficult! I can hardly believe it, but I’m making some real progress with this running thing. I’m a little worried about keeping it up when I go to Florida, but I’ll cross that bridge when I come to it. Now it’s time for bed so I can start another week of work. It’s crazy, but I’ll be in Florida soon! The day I got back home from my business trip to DC I was determined to go jogging since I’d been so lazy the week before. However, I didn’t get home from the airport until about 1 AM so I was kinda dragging when I woke up on Saturday morning. Fortunately the weather was still nice by the time I got going so I decided to go for a jog first thing. This required sunscreen. So I dug through my suitcase and pulled out the Aveeno Protect + Hydrate SPF 30 that I’d been meaning to test when I was in DC. I slathered it on my face, arms, and legs (all of which were dry from airplane travel), and went out for that much-needed jog. The sunscreen brought mixed reactions. First of all, it smells pretty good which is a quality that most sunscreens don’t possess. I definitely appreciated that. Wearing sun protection that doesn’t make your nose wrinkle when you catch a whiff of it is like a breath of fresh air. Literally! Also, as advertised, this sunscreen is very moisturizing. If you have perpetually dry skin then you will love the Aveeno Protect + Hydrate. And it might have been great for some activities, but unfortunately it didn’t absorb as much as I would have liked for a sunscreen to wear while exercising. This was my main complaint. It might not have been hot in Seal Beach that morning, but it was fairly humid so I was sweating a lot while running. And after my experience I would suggest that you not use this on your face if you’re going to sweat. It works great as a sunscreen and moisturizer, but not so good as eye drops. Usually I’m pickier about the sun protection I use on my face, but my skin was feeling particularly dry that morning so I just applied some of the Aveeno. I must say that it did moisturize extremely well, but my eyes were not happy when it started to drip. I won’t make that mistake again! (On a related subject, I’ve discovered that the downside of wearing a tank top while exercising means I don’t have sleeves to wipe sweat off my face!) So while I might use this Aveeno Protect + Hydrate sunscreen again, it won’t be for jogging! 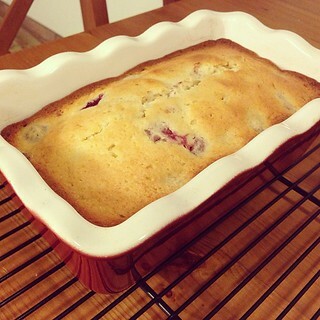 I made this raspberry pound cake the day after the really ugly but really delicious chocolate cinnamon pound cake. I just wanted something to turn out prettier! The original recipe made a single bundt cake, but I made two loaf cakes instead because I wanted to give some to a friend and take the rest to work to share. This cake is very similar to the strawberry buttermilk pound cake I made last summer and just as successful. Raspberries aren’t a traditional pound cake ingredient, but the result was very unique and absolutely delicious. And since the original recipe used a mix of raspberries, blueberries, and blackberries, you have lots of options. I want to try this one again with lime zest and blueberries before the summer is over! In a large bowl, cream together the butter and sugar. You can use a mixer or just a wooden spoon. Add the eggs and vanilla and mix to combine. Add the lemon zest or extract and buttermilk and mix to combine. Add the baking powder, salt, and 2 1/2 cups of the flour and mix until just combined, scraping down the sides of the bowl with a spatula as necessary. Toss the berries with the reserved 2 Tbsp of flour and add fold them into the batter gently. Some of them will get smushed no matter how careful you are, but don’t worry about it! Spoon the batter into two 9×5″ loaf pans (or a single bundt cake pan) coated with cooking spray (preferably one with flour). Bake at 325 deg F (I started at 350, but the edges started to burn) for 55-60 minutes, rotating the pan halfway through, or until a toothpick inserted in the center comes out clean. Cool the cakes in the pan on a wire rack for about 10 minutes before turning it out on the rack to cool completely. Enjoy! Based on Smitten Kitchen’s Triple Berry Summer Buttermilk Bundt Cake. Last night I had a problem. When I finally got home from the laundromat with all of my freshly cleaned clothes my options were stay home for the night or go out. And as tempting as it sounded to not have to drive anywhere, I knew that if I chose that route I would end up either sitting on the couch watching TV for hours or going jogging. Now jogging might sound like it would have been a great choice, but my legs were sore after increasing my mileage on Monday and Tuesday so they desperately needed a break. 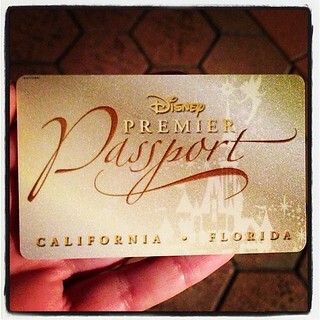 So to avoid the temptation I grabbed my keys and my annual pass and headed to Disneyland! The parks were crowded for a weeknight (hey, it’s still summer) so instead of trying to get on any rides I headed to California Adventure to get some dinner instead. Most of the food at Disneyland is mediocre at best, but there are some bright spots that you need to be aware of if you ever plan to get a meal there. One of my favorite places is Paradise Garden Grill that serves skewers with several different meal and sauce options. I’ve tried two different combinations – 1) Lemon-Oregano Chicken with Tzatziki and 2) Grilled Steak with Chimichurri (last night’s dinner) – and both were really delicious. I have written about my love of tzatziki many times (and even posted my own recipe) so I enjoyed the chiken with tzatziki the first time I ate there. And then last night I couldn’t get enough of the chimichurri sauce on the steak! While the meat wasn’t as tender as it could have been (a sharper knife would definitely have helped! ), it was still very tasty and perfect with the scrumptious sauce. Besides the skewers themselves, the rice pilaf, cucumber salad, and pita bread on the side are top notch. I cleaned my plate, which is very rare…just about anywhere! Plus it’s probably one of the healthier meal options in either of the parks. So if you find yourself in California Adventure, looking for somewhere to eat, I cannot recommend the Paradise Garden Grill highly enough. I’m actually planning on eating there again this weekend!